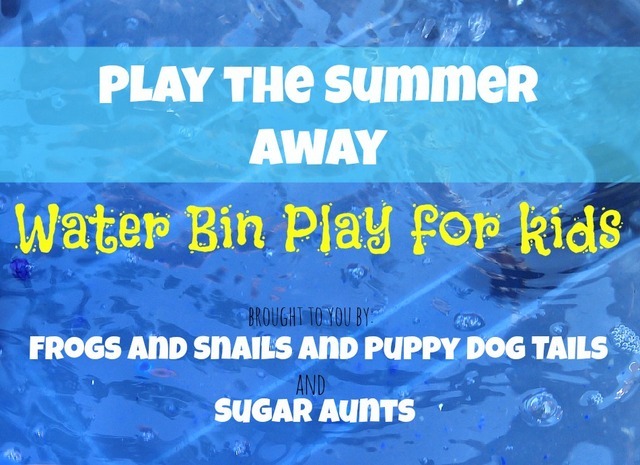 In case you missed last week's post, we are teaming up with Jaime from Frogs and Snails and Puppy Dog Tails in a Water Bin play series for the month of July. Did you see our Relaxing Lavender Water Bin we enjoyed last week? You can see all of ours and Jaime's water bins and themes each week by checking back here. We used our mini blow up baby pool for this water bin. We added sand and seashells from our beach combing collection. I stuck in a few drink umbrellas. (Watch the little kids with these...or leave them out...) We have a couple of coconut piggy banks from a cruise we took years back. 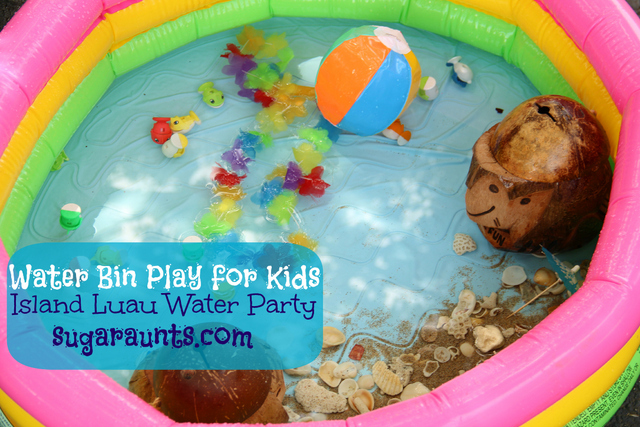 They added am island-y feel to our luau in the baby pool! Throw in a lei, a mini beach ball, and fish from an old (no longer working) fishing game. Little Guy loved the addition of the coconut piggy banks. He thought of putting the seashells into the coin slot of the bank. Great fine motor fun and manipulation work! We had fun playing with the shells, exploring the colors/textures/ sizes/features of the different shells. This was very relaxing and Big Sister, Little Guy, and I sat for a long time playing with this water bin. This water bin really got us in the mood for the beach! It was so much fun to catch the fish. 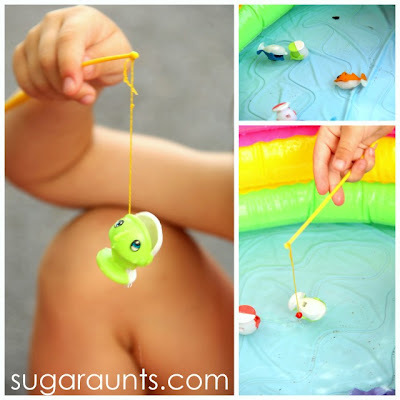 Because the fish need the battery operated game to make their little mouths open and shut around the magnet, we needed to put the fish on the end of the rod. But we could still "catch" the fish and pull them up out of the water. Little Guy loved doing this. 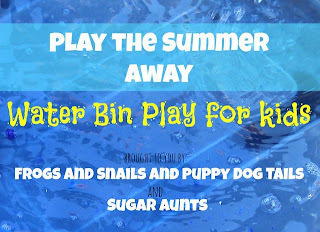 Now, let's stop over and see the Frogs and Snails and Puppy Dog Tails Beach Luau Water Bin. We can't wait to see what they've done with this theme! This post contains affiliate ads for your convenience.